People are choosing dental implants at an increasing rate to replace missing teeth, either as an individual tooth or as a support for other restorations. But unlike other replacement options, we must surgically install the titanium post at the heart of the system directly into the jawbone. While the term “surgery” might make you nervous, there's nothing at all to worry about. Here's what you need to know about before, during and after this relatively minor procedure. Before. 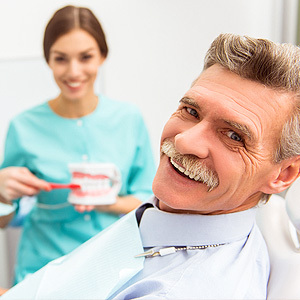 While the actual procedure is no more complicated than a tooth extraction, it ultimately depends on careful planning beforehand. Using x-ray diagnostics, we prepare a precise surgical guide to help us locate the best position to place them for a successful outcome. We'll also need to check bone volume to make sure there's an adequate amount to securely anchor the implant. If the bone is insufficient you may need bone grafting to build up the site or another replacement option. During. The actual procedure begins, of course, with local anesthesia to numb the site — you should feel no pain and very minimal discomfort. We access the bone through the gums; often using a surgical guide for alignment, we create a small channel or hole with a sequence of drills that gradually increase the size until it can accommodate the implant. We remove the implants from their sterile packaging and install them immediately into the channel. After confirming their proper positioning with x-rays, we can close the gum tissues over it for protection during healing or attach a healing abutment that extends through the gum tissue thereby avoiding a second surgical procedure. After. Because we disrupt relatively little of the soft tissue and bone, there's only minimal discomfort afterward easily managed with aspirin, ibuprofen or similar anti-inflammatory medication. We may also prescribe antibiotics to guard against infection while the gums heal. During the next several weeks, the titanium post, which has an affinity to bone, will become more secure as bone cells grow and adhere to it. It's also during this time that a dental lab creates your permanent crown or other restoration that matches the color and tooth shape so it will blend with your other teeth. This process is complete when we install the final restoration onto the implant. You'll have a new smile and better function.